Robbie Keane became the Republic of Ireland's leading goalscorer but Brian Kerr's side laboured to beat a poor Faroe Islands team at Lansdowne Road. Tottenham striker Keane scored both Republic goals in the first half which brought his international total up to 23 - two clear of Niall Quinn. Keane should have completed a hat-trick while Damien Duff, Andy Reid and Liam Miller also wasted chances. Roy Keane had a solid night but it was a largely sluggish Irish display. The first decent Irish attack did not come until the seventh minute when Duff tested goalkeeper Jakup Mikkelsen with a low drive. However, seven minutes later a superb mazy run by the Chelsea star earned the Irish penalty which enabled Robbie Keane to score his 22nd international goal - bettering the previous Republic record he shared with Quinn. Duff ran 50 yards and beat four tackles before he was unceremoniously hauled down by Jon Roin Jakobsen and Keane's low spot-kick hit the net even though Mikkelson got a hand to the ball. At the other end of the field, a slip by Kenny Cunningham threatened a moment of danger for the Irish in the 24th minute but John O'Shea got back to nick the ball away from Jonhard Frederiksberg. Robbie Keane's second goal on 32 minutes owed much to Roy Keane with the Manchester United star winning the ball in midfield and then squaring the ball unselfishly for the Spurs man to bundle the ball home. Inevitably, Duff was once again involved in the move with his clever pass releasing Roy Keane into space. With the Republic in total control, Duff then tested Mikkelsen with a low drive in the 39th minute and seconds later Reid blasted over from close range when it seemed easier to score. The Irish squandered another great chance three minutes into the second half when Duff pulled his shot wide after Kilbane had released the Chelsea man with a superb through ball. Further chances quickly came and went with Finnan, goalscorer Keane and Kilbane all going close. Kerr was then forced to make a change with Liam Miller replacing his Manchester United colleague John O'Shea who had reported a groin twinge. Robbie Keane should have completed his hat-trick in the 63rd minute but a slightly heavy first touch enabled Mikkelsen to smother the striker's pointblank chance. With the Irish efforts starting to look somewhat laboured, Brian Kerr introduced Gary Doherty for Andy Reid with 15 minutes left. Reid had tried hard all night but had been guilty of poor passing on several occasions. Miller was guilty of another bad Irish miss in the 79th minute after Duff's pull-back had set up a great chance. Keane then missed another great chance with Mikkelsen blocking the striker's effort. The Irish continued to huff and puff in the closing stages but there was little of the fluency which they produced in Paris last weekend. Roy Keane was named man-of-the-match but it was not a night that the Manchester United captain or his Irish team-mates will remember with any great fondness. 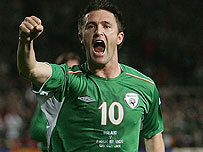 Rep of Ireland: Given, Carr, O'Brien, Cunningham, O'Shea (Miller 56), Finnan, Roy Keane, Kilbane, Duff, Robbie Keane, Andy Reid. Subs Not Used: Breen, Holland, Kavanagh, Kenny, Barrett, Doherty. Goals: Robbie Keane 14 pen, 33. Faroe Islands: Mikkelsen, Thorsteinsson, Oli Johannesen, Jon Roi Jacobsen, Olsen, Borg (Danielsen 85), Johnsson, Benjaminsen, Rogvi Jacobsen (Lakjuni 58), Frederiksberg (Flotum 83), John Petersen. Subs Not Used: Elttor, Knudsen, Nielsen, Berg.